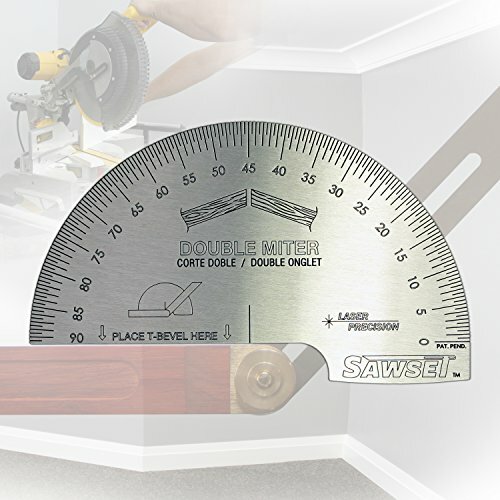 Sawset is a carpenter's protractor that has been redesigned to be compatible with any miter saw. Unlike a standard protractor its scales have been calibrated to give miter saw settings with absolutely NO MATH! The Sawset is double sided with 2 large easy to read scales, one for double miters and the other for single miters. With this simple to use tool and your T-bevel it just takes 2 easy steps to find absolutely any saw settings for any angle. This 18 gauge stainless steel engraved protractor is perfect for both Pros and DIYers alike! Sawset eliminates guessing, mistakes and waste. This saves you time and money. It will pay for itself the first time you use it! Perfect for Trim Carpentry, Flooring, Handrails, Spindles, Decks & much more! If you have any questions about this product by Sawset, contact us by completing and submitting the form below. If you are looking for a specif part number, please include it with your message.